Sometimes you just can't help loving a book. 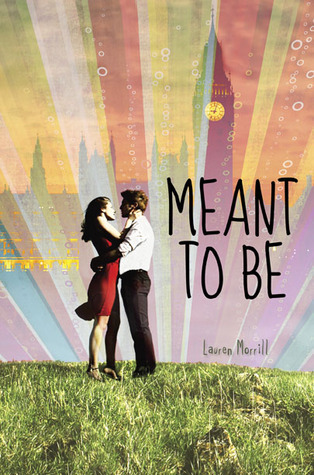 Meant To Be is one of those books that you should pick up when you're having a bad day. You'll laugh and roll your eyes at the characters' antics. Best of all, you will squeal with joy when the happy ending finally appears - this isn't a spoiler - we all know there's going to be a happy ending. Most of us bloggers can relate to Julia. Good girl, bookish, organized. She's an extreme version of the ideal student. I found her obstinacy quite annoying. I also thought it was strange that she was so obsessed with the concept of a "Meant To Be" soulmate. Such a fervent belief in one true love seemed at odds with Julia's practical nature. As much as Julia irritated me, I could see that she was a good person beneath all her type A baggage. I couldn't help rooting for her. Jason is the opposite of Julia. A jokester who lives for today. He was also annoying but less so. He could be a jerk at times and frustratingly irresponsible. But it quickly became clear that there was a nice person underneath. I look at Jason as a great guy who hasn't quite grown up yet, like many teenage boys. Soon, his recklessness and jokes seemed charming rather than annoying. I loved the book's London setting. London is probably my favorite city in the world. I haven't been there in seven years and I really miss it. I'm always happy to get a tourist glimpse of the city. The romance is just as satisfying as you would want it to be. The opposite of insta-love. The book takes place over a limited time period, but there's plenty of time for Jason and Julia to really get to know each other. Each character has to break down inner barriers that hides their compatibility. At times I wanted to smack their heads together, but I was ultimately pleased with how Ms. Morrill made sure Jason and Julia were each in the right place to make their relationship seem realistic. Meant To Be is a funny, joyful romance. Just as in the great romances, two flawed people learn to be more from the other person. It's an easy quick read that will bring out the warm fuzzies. Sounds awesome! I think I need a book like this right now. I am ALWAYS on the lookout for a feel good romance! When I'm tired, especially in the evenings, I simply can't force myself to read dystopias. And when I do read a romance, I don't appreciate angst so this sounds like a perfect read for me. I'm glad there wasn't instalove between Jason and Julia. It makes me want to pick this up even sooner. I've seen this one around but haven't picked it up. I do like a sweet romance and I know a few of my readers who would adore this book. I think I'll talk our librarians into getting it -- and read it first! After you review, I will totally pick up this book after a bad day. I need those books that can lift me to another world, making me happy. Thanks for sharing. I found Julia a bit frustrating, too! I am definitely a type A, but sometimes she was a little too snooty. But she did loosen up, and I did end up liking her. And how can I not love a character who loves Pride and Prejudice? I think your description of Jason was perfect! "a great guy who hasn't quite grown up yet, like many teenage boys." Glad you liked this. It was definitely a fun read. Glad you enjoyed this one! I had a lot of fun with this. I can totally relate to booklicker, though I'm not nearly as OCD as she is. I wasn't really annoyed with her, more sorry for her that her brain worked that way. :-) Awesome review! This sounds like a good book. I particularly like that they characters are flawed openly. I've heard a lot about this book. I really need to get it and read it already. Great review! great review.I am so excited to read this one and that it now it is available on audible. I'm glad this one was so good! I'm having the urge to buy it, but I know I'm so overwhelmed with books already, I'm not sure when I'd read it. This sounds just like the one I just reviewed (This Is What Happy Looks Like): charming and cute, likeable characters, and a great setting. Glad you enjoyed yourself with this one, Alison! I know I would, too. I'm so glad that you enjoyed this one!! It was adorable and really fun. And I loved that there wasn't an instalove - I didn't really like Jason, but I liked how their relationship progressed. Glad this worked for you-I found Jason so annoying and had trouble pushing through it despite loving the cover. I really enjoyed this one and it really surprised me because I am not a comtemp fan, I definitely agree with you especially with the fact that if you are having a bad day this book will definitely pick up your mood!